Portland Trail Blazers New 2009-10 Uniforms? 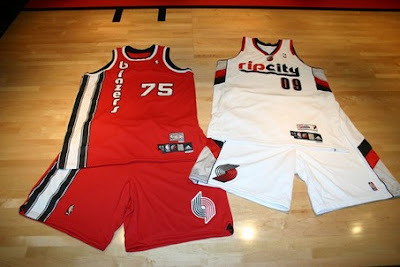 I'm down with the red, retro look but what's with the white jersey spamming "Rip City" cross the chest? Sure, it's a nice slogan that's stuck with the team forever, but does it really need to be plastered on the front of the jersey? I love the overall look of the whites, but having "Rip City" on the front is just a little weird. And it looks like you can already pre-order one of these bad boys if you'd like! Available October 1st! I thought the white ones were an alternate and the red ones are the hardwood classic for throwback games. They'll still have the jerseys they wore last year...these are for special games. You are probably right and it looks like they are still selling last year's jerseys for everyone at the Blazers store. Both jerseys are alternates, they'll only be worn a handful of times. the uniforms we normally use are still going to be used on a regular basis. They are nice, with a old school flair.